Sizer is a free portable tool that allows you to resize windows to specific sizes with one click. This might come handy when you need to create screenshots of a specific size frequently. Just run the tool and it will sit in the system tray. Now, to resize any window just right-click on the maximize button or titlebar of the window which you want to resize and select your new size. 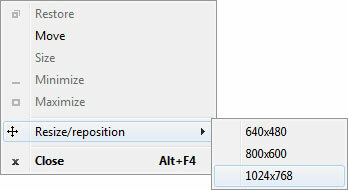 There are three default sizes available : 640x480, 800x600 & 1024x768. You can also create custom sizes by double-clicking on its tray icon which will bring up the Settings window.